Durable and lightweight hardware that is designed for frequent use anywhere.Soft carrying case is also included.By which you can show your ingenious ideas by hanging different dimensional fabric graphics.Requiring only a few minutes to set up,you can use our stands for multiple occasions and tasks without any headaches.Telescopic banner stands can be used with banner graphics (vinyl/fabric). Portable,easy to transport and set up.Free-standing, adjustable. Can be used as double sided unit if desired. Banner can be hanged with sleeves top and bottom. Durable and heavy duty hardware that is designed for frequent use at trade show. 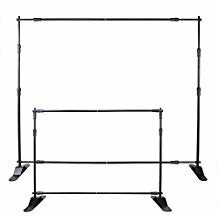 Width range:66" - 120" / Height range:37" - 96"
Suit for photo booth background,trade shows,store promotion banner,conferences,exhibitions etc.